A large cistern in the ancient city of Resafa, Syria, was filled by channeling periodic floods from a wadi west of the city. The use of complex systems for directing and harvesting water dates back thousands of years. Photo from “Ancient Water Harvesting Methods in the Drylands of the Mediterranean and Western Asia,” Brian Beckers et al., eTopoi, 2013. A mountain, a river, a reservoir, a maize field, a street, a gutter, the sewer, a roof; they all receive rain and therefore, they can all be considered rain catchers. Catching water has important implications for food and energy production, environmental uses, water supply, and also for wastewater management, which is the topic of World Water Day 2017, March 22. Rainwater harvesting is usually associated with supplying water (mostly for irrigation), not so much as a wastewater control strategy. But this may change in locations where flooding and combined sewer overflows—when the capacity of wastewater treatment systems is exceeded and untreated water is released to waterways—are a problem. But the potential effectiveness of harvesting rainwater varies greatly from place to place, even within a particular city or neighborhood. 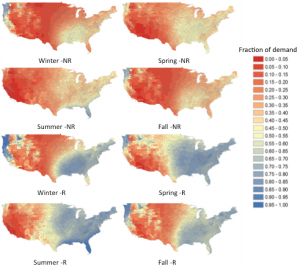 Now researchers at the Columbia Water Center have developed a tool to assess the potential of rainwater harvesting in the United States, county by county. The idea of rainwater harvesting has been around for millennia, not only for agriculture but also for urban water supply. In the ancient city of Resafa in Syria and in the Negev desert in Israel, rainwater catchment systems were used to source or supplement the agricultural and domestic water demand more than 2,000 years ago. Water stress in modern cities derives from increased population, climate variability, reduced water sources, and uncontrolled and competing demands from agriculture, energy and industry. This is forcing water and development experts to rethink the ways in which water is sourced. 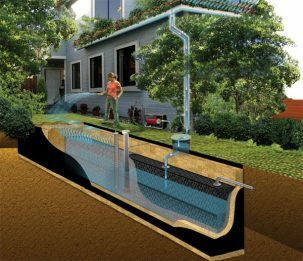 Rainwater harvesting is one of the alternatives being considered, and it is gaining popularity in countries such as Australia, Germany, Singapore, Denmark, Canada, the United States and others. Recent patterns of floods followed by droughts and droughts followed by floods in the United States (such as in Texas and California) have exposed the vulnerability of our water supply and infrastructure, which can be addressed creatively using solutions like rainwater harvesting. In cities with combined sewers, where surface runoff and wastewater get combined in the same pipes, to be treated, rainfall can be a burden to wastewater treatment plants. During high rainfall events, it becomes a problem when waterways are contaminated due to combined sewer overflows (as in New York City and Mexico City). Large retention tanks can be used to slow down the flow of wastewater so that treatment plants can handle the volume during high rainfall events, but depending on where they are located, they can also pose contamination risks. A domestic rainwater harvesting system from Atlantis, an international company that engineers systems to capture rainfall and runoff, and other “green” infrastructure. The implementation of rainwater harvesting at a large scale could be part of the solution to reduce runoff in order to mitigate flooding and maybe even reduce the number of overflows from treatment plants. A study from 2016 on the potential runoff reductions from installing rainwater harvesting systems in Philadelphia, New York City, Seattle and Chicago concluded that runoff reductions could be greater than 75 percent. Even in cases where rainwater harvesting was not an attractive solution for water supply, as in densely populated buildings, it could still have an impact in runoff reduction. Due to local variations in rainfall, demand, catchment area, water price and regulations, the applicability and performance of rainwater harvesting for water supply or runoff reduction will vary. It is important to know where rainwater harvesting makes sense—what can be expected in terms of performance (for example, the percent of the demand that can be covered in each season), and what is the best way to use the harvested rainwater to comply with local regulations, water quality, and in a financially smart way (irrigation, toilet flushing, potable uses, drinking, runoff reduction, etc.). Members of the Columbia Water Center developed a tool to assess the potential of rainwater harvesting in the United States using two approaches. In the first one, the performance of a household rainwater harvesting system was tested across all counties in terms of the fraction of the demand that could be supplied with it by season and annually. This approach considered local precipitation data, and a fixed rooftop area, tank size and water demand for all locations. 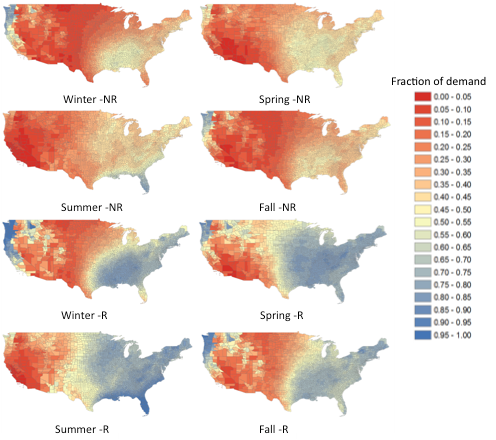 The conclusion was that households in the central and eastern regions of the U.S. could supply more of their water demand with rainwater harvesting than those in the western counties, using the same assumption of rooftop area and system configuration (more than a 20 percent difference, on average). If a 50 percent water reuse component coming from the harvested rainwater was introduced into the system, more than 60 percent of the daily water demand of a household (potable and non-potable) could be satisfied in the central and eastern U.S., but in the West, the percent demand that could be covered remained low at around 10 percent. In the second approach, the idea was to estimate how much rainwater could potentially be covered if all the household rooftops in a county were to be used as catchment areas, and how much of the total county water demand (excluding agricultural uses), could be sourced from the harvested rainwater. To obtain this, the amount of water harvested (rooftop area x rainfall) was divided by the water demand by county. The main issue with this approach is that rooftop areas are not publicly available for all counties, so the researchers came up with two methods to estimate it. The first method is a simple multiplication of the number of households in a county and an average rooftop size of 116 m2 based on information from the U.S. Census Bureau. The second method used building footprint area information from 40 counties to do a regression of area as a function of the number of households. Note that the building footprint data in the second method includes all types of buildings, not only houses, so the estimations are not accurate in counties with low population density. The results between the two methods vary greatly, although they are highly correlated and give similar patterns. In general, central and eastern counties could supply more of their water demand using rainwater harvesting than western counties. As in the first approach, this information should be used to analyze patterns across counties, not to rely on the actual fraction of demand number, because many assumptions had to be made to obtain it. For more accurate results, analyses at lower scales (county, city, neighborhood) can be done if the data is available. Although the impact on runoff reduction was not included in the tool, the results are useful to identify the regional performance patterns of rainwater harvesting. This can inform decision makers at the county level to define if rainwater harvesting should be promoted in their regions, and to decide if the impact on runoff should also be explored. Regulation is a key factor to make rainwater harvesting a widespread practice. In the United States, rainwater harvesting, done at the state level, has been changing in the last decade. Up to 2016, rainwater harvesting was illegal in the state of Colorado, because the law stated that precipitation belonged to existing water-rights owners, but now it is permitted within certain boundaries. Texas on the other hand even provides incentives and allows rainwater harvesting for potable uses, unlike most states. Rainwater harvesting is an important emerging option in the U.S., even though places such as Israel incorporated it in their overall system design several decades ago. The screening tools developed by the Columbia Water Center can help investors and local planners explore options by which rooftop collection, including possible coupling with rooftop solar heating or electricity generation, can transform building codes and investment directions toward local solutions and sustainability for water and energy in the 21st century.